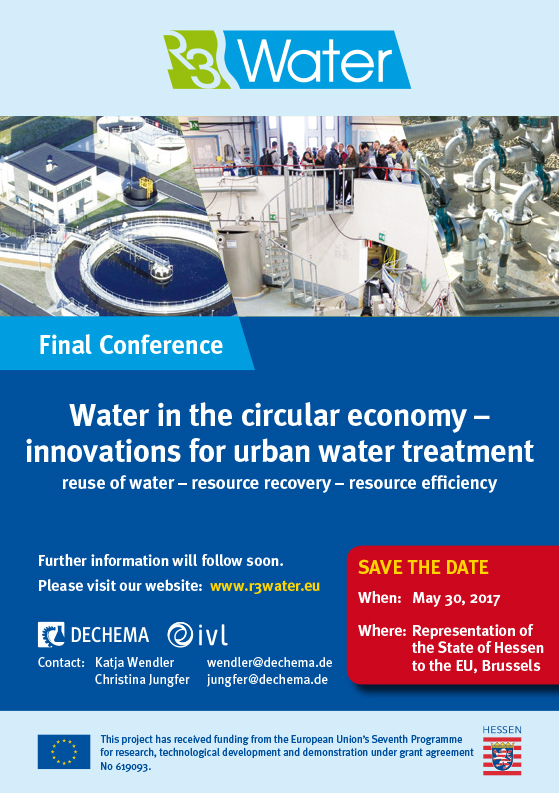 Next 30th of May, the R3Water project will celebrate its Final Conference "Water in the circular economy – innovations for urban water treatment” in Brussels. The European project R3WATER - Reuse, Recovery and Resource efficiency, Innovations in urban wasteWATER treatment, has received funding from the European Union’s Seventh Programme for research, technological development and demonstration under grant agreement No 619093. On the day different topics will be discussed, among them, demonstrate innovative wastewater technologies that enable reuse of water, recovery of valuables such as nutrients. To see the programm of the day click here.